Whether in the studio or live on stage, Lagudi relies on the Furman® P-1800 to deliver clear, unwavering power supply while touring the globe. 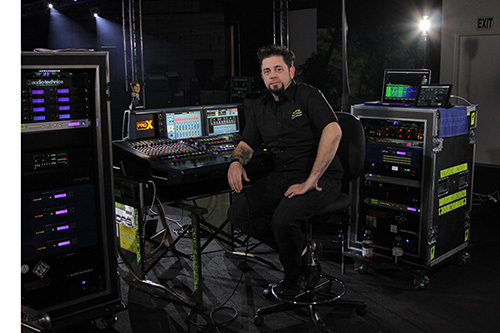 CARLSBAD, CALIFORNIA — Machine Head sound engineer Steve Lagudi is power hungry — but not in the traditional sense. Lagudi’s thirst for power is all about delivering unwavering sound, clarity and punch, for the bands he does the sound engineering for, both live and in the studio. To quench his thirst and make sure all that power is delivered on a reliable and consistent basis, Lagudi relies on Furman® power solutions by Nortek Security & Control. Lagudi has 20-years as a sound engineer working with artists such as Exodus, Testament, God Forbid, Shadows Fall, Ill Nino as well as the band he’s currently on tour with in Europe, Machine Head. That’s an impressive list of power-driven rock bands, all with a very guitar heavy blend. The Furman P-1800 accepts input voltages over a wide AC voltage range and transforms it to a constant output of 120V, + 5V. Laugudi uses a step-down transformer when the band tours overseas to cut the voltage in half but the voltage still fluctuates – 210vac=105vac – and the P-1800 can handle 90vac to 140vac. The P-1800 AR is a full-featured power conditioner that filters and purifies AC power, reducing line noise and ensuring optimum performance. Using Furman’s Linear Filtering Technology (LiFT) that is designed to counter electrical noise that distorts low-frequency information, the P-1800 helps significantly lower the noise floor, thereby uncovering this important low-level information. Lagudi made an emergency call to Furman and six P-1800 AR’s were immediately shipped out and. Lagudi and Machine Head have been using Furman ever since. Furman® is legendary for developing award-winning, innovative power management products. Furman power and energy management products give audio/video systems the pure, noise-free power they need for superlative performance while protecting them from damage caused by power surges and lightning. The brand addresses all major electronic markets, including professional audio and video, the music industry, broadcasting, audio/video recording, office equipment and home theater. More information is available at www.furmanpower.com. Nortek Security & Control LLC (NSC) is a global leader in smart connected devices and systems for residential, security, access control, and digital health markets. NSC and its partners have deployed more than 5 million connected systems and over 25 million security and home control sensors and peripherals. Through its family of brands including 2GIG®, ELAN®, GoControl®, Linear®, Mighty Mule® and Numera®, NSC designs solutions for security dealers, technology integrators, national telecoms, big box retailers, OEM partners, service providers, and consumers. Headquartered in Carlsbad, California, NSC has over 50 years of innovation and is dedicated to addressing the lifestyle and business needs of millions of customers every day. Any other brand names and product names mentioned herein may be the trademarks, tradenames, service marks or registered trademarks of their respective owners.